Buy it on CreateSpace eStore, Amazon and Amazon Europe. Visit the website, and the Facebook page. Learn about the dual event that marked the launch of The Irreverent Activist. As a Syrian pro-democracy and human rights activist living in exile since 2005, Ammar Abdulhamid is attuned to a growing sense of angst and despondency over the direction of current world events. To address this and inspire resilience in the face of adversity, he has compiled this collection of thoughts reflecting his struggle to keep going as an activist for over twenty years. Mirroring the Tao Te Ching, the classic Chinese poetic prescription for life balance, Abdulhamid’s text comprises two books containing short segments—full of intriguingly candid contradictions—which encourages contemplation. But far from being prescriptive, even his most vehement affirmations are inquisitive in nature, probing the realities that confront us as human beings. “Book One: Heretical Affirmations,” which contains singular thoughts that are heretical to the feel-good positive thinking so popular today, is counterbalanced by “Book Two: Abel’s Confessions,” a collection of poetic reflections illuminating Abdulhamid’s inner turmoil and all-too human vulnerabilities. “From the depths of one of the world’s least free countries he has miraculously emerged, the freest of free spirits, a restless soul, and a true original.” —Joshua Muravchik, author of Trailblazers of the Arab Spring. “Ammar Abdulhamid throws down a challenge to his reader to make a whole of the jigsaw pieces of an all-too-human being, revealed by this little book in an intimacy that few works of any genre or length attain. One senses the agonized self-knowledge, beyond self-pity or self-promotion, of someone who has striven in a noble cause, but whose success has been deferred by the impersonal forces of history, which is to say, the imperfections of the human heart. In The Irreverent Activist we encounter a titanic personality tested by cruel reality, aware, as few of us are, of his limits and of his strength to know and transcend them. The reader will not emerge unscathed.” — Eric Gans, Editor, Anthropoetics: The Journal of Generative Anthropology. 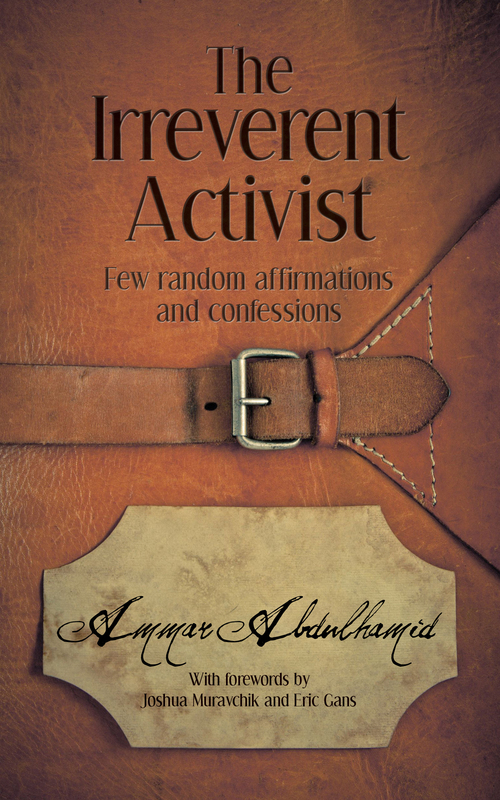 “Ammar Abdulhamid is a young man who embraces the East of his birth and the West of his future and this collection of reflections illustrates his courage to share the hard truths all of us face. It is also a book of illumination and of an awakening of the mind and the soul. Simply put, it will dare you to question.” — The late Fouad Ajami, author of The Arab Predicament, The Dream Palace of the Arabs, and The Syrian Rebellion. “This is an important work, a book that brings a perspective from a Syrian writer, thinker and philosopher that causes the reader to step back and rethink one’s assumptions about Syria, even one’s life. Ammar Abdulhamid’s book is a must read for those who are trying to understand why Syria is the way it is today and why certain individuals keep plodding ahead even in the face of tragedy.” –David M. Crane, Former Chief Prosecutor, Special Court for Sierra Leone and director of the Syrian Accountability Project. “Ammar Abdulhamid has been one of the brightest stars in Syria’s pro-Democracy firmament. He is a true liberal and revolutionary. A decade ago, he caused a firestorm in Syria’s activist circles by denouncing Arab nationalism, calling President Assad a “fool” publicly, and championing Kurdish and women’s rights in his think tank in Damascus. During the opening weeks of the Syrian uprising, Abdulhamid wrestled openly with the terrifying prospect that the Syrian opposition was not prepared or strong enough to take on the brutal Assad regime. One cannot have a surer or more honest guide to the inner-workings and conscience of Syria’s opposition movement than Ammar Abdulhamid.” –Joshua Landis, Director of the Center for Middle East Studies – University of Oklahoma. “Ammar Abdulhamid’s extraordinary reflections are anything but irreverent. Searingly honest, bitter, unadorned, and unrelenting, they overcome despair and, at times, inspire, through their insistence on the possibilities and potential that reside in us all, however flawed and vulnerable we may be.” –Steven Heydemann, Vice President, Applied Research on Conflict, United States Institute of Peace. “These dark aphorisms from an activist and “heretic” who “can respect but never revere” originated as tweets or Facebook status updates, yet some look a little like ejaculations from Nietzsche or one of the classical Sufi seekers. Reading them is a strange journey into a crash site of genres, made more strange and much more immediate by the knowledge that the phrases were squeezed from Syria’s blood-sodden struggle for freedom. They reflect on war, religion, history, and the human heart, and do so with a vulnerability and stark honesty usually absent from revolutionary discourses.” –Robin Yassin-Kassab: author of The Road from Damascus, a novel. He co-edits http://www.pulsemedia.org and blogs at http://www.qunfuz.com. “One way to read Ammar Abdulhamid’s “Heretical Affirmations” and “Abel’s Confessions” is as a long meditation on Syria. More generally, it is a window through which readers will discern how the author’s experiences there have shaped his own philosophy of life. Profoundly pessimistic in places, Abdulhamid’s collection is thought-provoking, profound and invariably original.” –Michael Young: opinion editor at The Daily Star newspaper in Beirut and author of The Ghosts of Martyrs Square: An Eyewitness Account of Lebanon’s Life Struggle, 2010. “Ammar Abdulhamid’s, The Irreverent Activist, is the work of a truly unique voice from Syria grappling with the injustice and horrors unfolding in his homeland. Through his Affirmations and Confessions, as he calls them, Abdulhamid provides a way for readers to better understand the darker sides of life, while providing catharsis from the pain.” –Kate Seelye: Sr. Vice President, Middle East Institute. “Inspiring, even mind-bending, and thoroughly avant-garde, and that’s just in the first ten pages. Ammar Abdulhamid is a writer of unparalleled scope and an activist fueled by a passion for pursuing justice. This book is full of wisdom and creativity; its author is one of the righteous among us, no doubt about it.” –Scott Lasensky, co-author of Negotiating Arab-Israeli Peace and the Peace Puzzle. “The world has forsaken the Syrian people and the leaders of its once peaceful uprising. Ammar Abdulhamid, a veteran activist who played a crucial role in the country, reflects with heart-wrenching charm and wisdom on the losses as he searches for new hope and a way forward. Wit and brevity disguise the hard lessons learned from the 21st century’s most tragic revolution.” –Roya Hakakian, Iranian-American poet, journalist and writer. Author of Journey from the Land of No. “If you want to understand what drove the Arab world to rise up against its leaders in 2011, Ammar Abdulhamid’s work is a good place to start. He has always been well ahead of the curve in understanding the region’s potential—and problems. This book takes us deep into the soul of someone who helped pave the way to the revolution in Syria; has felt and thought deeply about authoritarianism, democracy, sectarianism, war, and peace; and paid a high personal price for his beliefs.” — Seth D. Kaplan, Professorial Lecturer, Paul H. Nitze School of Advanced International Studies (SAIS) at Johns Hopkins University, and the managing editor of the Fragile States Forum (www.fragilestates.org). “A wise, challenging and provocative collection of aphorisms and poetic reflections, Syrian writer Ammar Abdulhamid could perhaps be a Khalil Gibran for the 21st century.” — Ken Ballen, author of Terrorists in Love and President, Terror Free Tomorrow.